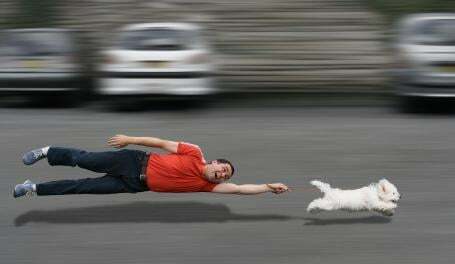 Enjoy Stress Free Dog Walking! Are your dogs more interested in the squirrels, cats and other dogs while on a walk? Is your dog pulling hard causing you pain in your shoulder? Is your dog harming themselves by pulling? Did you know that if Fido lunges forward abruptly or you jerk on the leash/collar, you can cause serious harm to their neck and vertebrae. Are you craving a relaxing walk with your best friend but feel you have tried everything? Read my tips below for helpful suggestions to peaceful dog walking. Dogs pull and learn that when they pull they get to move forward they are being trained that Pulling=Move Forward. Don’t be in a hurry your dog isn’t. Dogs love to stop and smell the grass, fire hydrant, tree base, curb side, bushes ect. They want to check out all the pee mail since there last cruz through there hood. Lets learn from our pets and listen to what they are telling us. When your dog is pulling and going in a different direction than you, just stop. It’s that easy! Dogs pull, they are rewarded for pulling because we keep moving. Its so simple its silly. Try stopping next time you dog is pulling and just wait. When they realize you aren’t budging they will turn and look at you as if to say…”Hey!”…. This is the Aha moment. You say, Good Girl! And begin moving again. Yes, you will feel like your playing a game of red light, green light but if you are patient and be consistent they will learn that pulling means stop. Loose leash = walk. Bring treats and wear a treat pouch. Reward your dog for “checking in” with you. Stop at a park bench, if you have one on your route. Relax and take in the scenery. Ask your dog to lay down and reward him. After a few minutes get up and say “lets go”. You are taking the opportunity to train your dog on a walk and teaching them that YOU are the leader. All the new scenery, smells and activity is stimulating your four legged friend. It doesn’t matter how fast you walk, just that you give them an opportunity to change their scenery, get some exercise. Take time to stop and smell the roses! Congratulations! You are on the yellow brick road to a peaceful dog walk.